I must say that I’m absolutely tickled by the various Science Fiction options I have this fall television season. Some seasons there isn’t much at all, but for some reason this fall has some great choices. 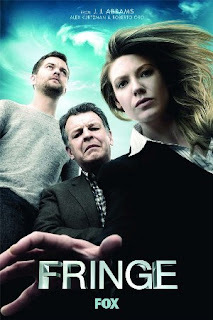 First there is the continuation of Fringe, a quirky yet intoxicating series based in Boston (my favorite city notwithstanding my living in L.A.). Anna Torv, playing the Olivia character has become my favorite television actress. I still don’t know how she hides her native Australian accent. Fringe took a short break lately due to Fox coverage of the World Series, and I look forward to the next upcoming episode. Then there is Stargate Universe, yet another installment in the long-running Stargate series. This time, all new characters and actors were chosen unlike previous Stargate programs that carried forward some characters. After a few episodes I’m a big fan and look forward to find out how they eventually get off that Ancient ship. One oddity this season is the new series Defying Gravity. I really liked the show all about a crew travelling to Venus with a deep, dark secret that was withheld from them by mission control. The problem is that the show seems to have been canceled after only a handful of episodes, all without telling us what the deep, dark secret was! Painful. And I finally got on board with the Sanctuary series. I’m not sure why I haven’t tried it thus far, but so far the few new episodes I’ve sampled are pretty good, if just a little bit silly in some places with the special effects used to create the “abnormals” running around Earth. One reason I like Sanctuary is that it stars Amanda Tapping who is from a couple of the older Stargate series. Finally, I was looking forward to the premiere episode of V which debuted this week. I’ve seen a bunch of trailers for the show where Anna, the leader of the V’s, is projected worldwide as she preaches a phony message of hope, and peace. Too bad the “visitors” aren’t what they seem to be. The first episode was a bit ridiculous in places, but I’ll give it a few more tries before I pass judgment. So are all Science Lifestylers also SiFi nerds? Tell me!